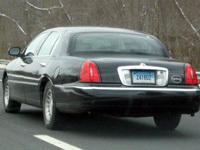 These plates are used on limousines, for-hire cars, and light buses licensed to operate interstate as livery vehicles. I am not sure when this type started - I believe the 1920s - although originally Interstate plates were also issued to commercial trucks operating interstate. In the 1940s and 1950s, similar to Bus plates there existed a "General Dist. Interstate" type - colors were the same as regular Interstate plates but had a single letter prefix before a 2-digit distinguishing number. An operator would receive plates with the same distinguishing number, while the letter prefix changed for each plate issued (e.g. A 30, B 30, C 30, etc.). In the late 1980s or early 1990s, the format changed from all-numeric to one having a 'Z' prefix and suffix - similar to Livery (L) and Taxi (T) plates. The present configuration is Z1234Z. Around 2012, after reaching Z9999Z, they went back to the Z2000Z series. In 2016, a 7-digit format was started presumably at Z00000Z. The use of date stickers was discontinued with the 2008 expirations.